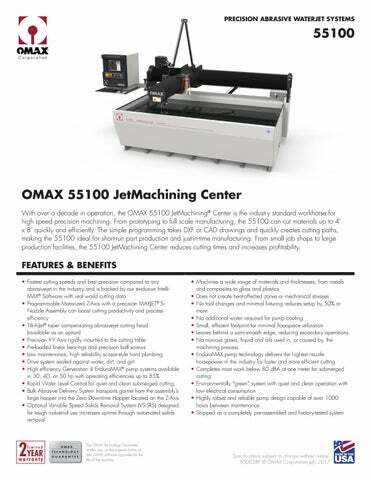 OMAX 55100 JetMachining Center With over a decade in operation, the OMAX 55100 JetMachining® Center is the industry standard workhorse for high speed precision machining. From prototyping to full scale manufacturing, the 55100 can cut materials up to 4’ x 8’ quickly and efficiently. The simple programming takes DXF or CAD drawings and quickly creates cutting paths, making the 55100 ideal for short-run part production and just-in-time manufacturing. From small job shops to large production facilities, the 55100 JetMachining Center reduces cutting times and increases profitability.